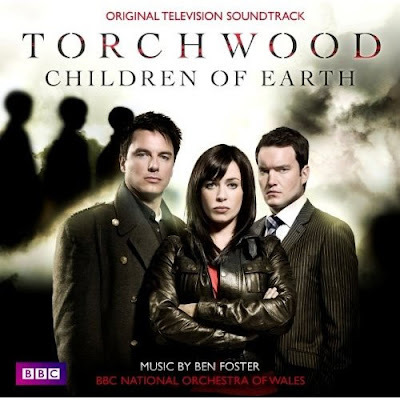 Some fans may not like it but I think Ben Foster's music for the five part Torchwood: Children Of Earth truly allows him to step from out the shadow of his mentor Murray Gold. It demonstrates he can deliver music that's as strong as anything that could be considered Gold's best for Doctor Who. There. And I've been saying it since reviewing the first Torchwood soundtrack album. The album opens with The First Sacrifice, lushly romantic music that suddenly plunges into tense high strings. It's a compositional arrangement that will crop up through all five episodes as a musical motif for Jack's original exchange of the children in 1965. Onto business as usual with What's Occurring, with its lovely driving strings and percussion punctuated by those big, fat blasts of brass as Gwen clacks into work and the team start poring over their Hub monitors. The gorgeous piano motif for Jack's Daughter is supplemented by lush strings, a hint of tragedy already embedded into the theme. Quite lovely and sad. Diplomatic Cars is that unforgettable cue from Day One. Pumping brass sections, skittering percussion and that Bondian feel, explored in similar fashion by David Arnold, that's later developed into a terrific piece of music in Thames House that pulls in much of the feel of Murray Gold's UNIT theme from the parent series, throws in subtle electronic tonalities, stunning brass parts, and an overall string motif to make it the signature music for this series. Foster takes many of the threads from these themes - the brass and strings in particular - and uses them as the key parts of the more frenetic cues like Double Crossed and Countdown To Destruction. Very stirring themes, they develop out of much of the work he put in on the previous two series, underscoring the action elements of the story beautifully, especially that really climactic clatter of strings, brass, guitar and percussion that signals the destruction of the Hub. 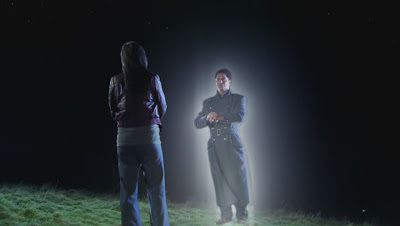 Torchwood Hunted equally has squally guitar and percussion driving along with some wonderfully accelerating strings. He takes all of these ideas and then throws in more brass and some choral emphasis for The World Looks To The Skies. The scoring for brass is especially stunning. Foster certainly ups the ante on the action stuff and if he was asked to score a Bond movie tomorrow I'm sure he'd be up to the job. He's also at home underlining the hideous threat of the 456 with his cues We Are Coming and Something's Coming. He captures their creeping unearthliness in slow strings, plucked sections and that repeated use of a discordant set of arpeggios. There are also some very sensitive cues that are purely used as character defining motifs - the gorgeous music for Clem in Clement MacDonald and Clem Remembers - high strings symbolising the man's terror followed by warm and romantic strings and piano that echo the tragedy of his connection to the 456. The latter also has a beautiful vocal section with harps. Vocals are also very much to the fore in Judgement Day and Annalise Whittlesea and Lewis Cullen provide very memorable choral work, interspersed with some twangy guitar sections and soaring strings, those repeated brass parts, that are reworked later in the score during Jack's ultimate sacrifice. It's lush and powerful and definitely one of the highlights of the score. If Requiem For The Fallen and The Ballad Of Ianto Jones don't have you wiping away a tear then quite frankly you've no soul. Vocalist Annalise Whittlesea returns with a very moving performance on both tracks. Ianto's theme is given due prominence here and built upon with said vocals, mournful twangy guitar and pulsing treated keyboards. It finally bursts into full rock mode and the guitars and swirling strings and piano sections all hurtle towards a fabulous crescendo. Think Donna's music from Turn Left cranked up to 11! Full of lost possibilities and mournfulness, it's gorgeous music and for me is a fitting tribute to the character. All the cues are arranged as they appeared in each episode and for Day Five, there's the lovely Calm Before The Storm, full of sadness; the gritty determination of Phase Two has Begun, again echoing Foster's overall theme as the music turns to the threat and fear of a government using troops to round up the children. Requisition 31 is as uncomfortable as the scene it scores, namely Frobisher's decision to murder his own family. High, tense strings, staccato piano and then sad, Mahler like strings augmented by percussion and a brief section of Foster's main themes. Again, some very sensitive scoring is accomplished for He Was A Good Man, that unforgettable exchange between Lois and Bridget Spears. The Children Of Earth is stunning, aided by a soaringly beautiful Lewis Cullen vocal, soft romantic strings covering a slower articulation of those characteristic arpeggios. Breaking The Connection and Fighting Back take the album towards the shocking conclusion of the series and define the way that Jack and Gwen turn around the dire situation. Connection is wonderfully atmospheric with drawn out atonal brass and high strings. Fighting Back, jittery percussion and lush strings dotted with those lovely brass sequences, dares to suggest hope momentarily and overlaps into Run For Your Life as Gwen attempts to smuggle children away from the authorities, with a grand and sweeping use of the orchestra. Both tracks then form a linked suite with Sacrifice And Salvation as Jack uses his grandson to destroy the 456. Again, soaring and powerful. Finally, Redemption and I Can Run Forever sensitively explore Jack's mindset after all that has happened. Great string composition, subtly exploring the emotions of the hero who has had to make personal sacrifices and unpleasant moral choices in order for the Earth to survive, with breathtakingly beautiful vocals from chorister Lewis Cullen. I Can Run Forever is another outstanding piece, using the established Captain Jack themes and hints of fallen Torchwood comrades with brief nods from the Tosh, Owen and Ianto themes. To end the album, a little treat with Here Comes Torchwood, firing on all cylinders with staccato brass, scratchy guitars, electronic percussion, chugging strings, and Next Time On Torchwood, a rising musical motif that ends with crashing drums that was used as the tag for each episode. Superb. No other word will do. Essential purchase. I Can Run Forever is another outstanding piece, using the established Captain Jack themes and hints of fallen Torchwood comrades with brief nods from the Tosh, Owen and Ianto themes.